Way Upstream community around the world, a challenging project is now at the forefront. The project is to redesign and possibly redefine an icon. This icon is the SST Jacket (SST stands for salmon, steelhead and trout). This jacket was born in 1989 and has been often copied but never duplicated (top left). Since it's introduction, the SST has continually set the standard for on-the-water weather protection. Today’s version features 3-layer stretch nylon fabric with H2No® waterproof/breathable barrier (bottom right). So what’s driving the change idea? Spring 2008 jacket development (new Guidewater Jacket and redesigned Deep Wading Jacket) is causing closer inspection of this SST reinvention concept for S9. I have some ideas about where I’d like the design to go and I’m sure YC has his ideas too but where do you think it should go? Think about the SST and tell me what you like, wish for, want to improve? Consider color, pocketing, cuffs, hood, salt/freshwater and so on. Tell me stories of your SST. Who knows, maybe you think it’s fine as is, but either way, let me know your thoughts. Ahhh- the SST- my favorite, not only for fishing on those blustery days, but wearing it around town, to work, etc. For fishing, I would like a more waterproof fabric from the wrist to the elbow. This area does not need to be breathable, but when you stick an arm in the water, it needs to be completely waterproof, and dry very quickly. When the temps are 30 degrees outside, you want the material to dry immediately and not freeze up and become stiff. A fly patch Velcro inside one of the large packets would be nice, a quick place to store flies. I like this better than one outside. Also sell it with a detachable "zinger" (two would be better), the type that coils often found on fishing packs, rather than the retractable wire type. The attachment should be secure, but not detract from the jacket appearance if removed to wear around town. Many, if not most, people are taking a small digital camera with them fishing. Have a completely waterproof pocket, high up close to the shoulder, and padded, for camera storage. High up decreases chance of hurting the camera in a fall, as we instinctively protect our face/neck in a fall. This addition would also make it a great travel jacket. A small pocket on the outside below the large pockets for tippet storage would be nice. Go back to the more durable fabric and add pit zips! Every one I know hates the small zipper on this other wise outstanding jacket. Just make the zipper big enough to handle when it's 15 degtees out and the wind is whipping. The oldschool sst is the best. I agree that the zipper needs to be bigger. Front pockets could be a bit bigger as I tend to pack larger boxes. I own a 2006 SST and absolutely love it. My only suggestions are to add pit-zips and perhaps some built in retractors. I really like the rod holding feature, the deep pockets, the flexibility, and the clean cut. I agree the SST needs pit-zips. Considering Patagonia has employed pit-zips in their jackets for many years, I’ve always been puzzled as to why this feature hasn’t found its way to the SST. I also like the idea of a 3-layer rip-stop fabric. And finally, please give us more color options (ala Simms and Cloudveil who are making their wading jackets in blues and reds); I’d love to see a redesigned SST in a dark blue, for instance. waterproof pocket is good not only for a camera but most cars today come with electronic lock key - you don't want that gadget to get wet either. I've had an SST since the early 90's and it is bombproof. My suggestions would be to soften the fabric on the back of the neck somehow (perhaps some Schoeller) as it gets scratchy when I'm wearing a collar-less shirt underneath. I'd like to have a fly patch on the chest. I have pinned a patch on the velcro rod-keeper so as not to puncture the fabric. This, of course makes the rod keeper less useful. Waterproof zippers that could accomodate a digital camera--but keep in mind that getting that out while holding a net in one hand and the rod between your knees, etc, etc,...make it easy to open. I'd suggest a waterproof zipper that zips down so your shoulders act as tension. Perhaps add a small slash pocket below the bellows pockets to hold split shot or floatant. If I'm wearing the SST, I'd think I could get away without having to use a fanny or chest pack. I've never used the massive back pocket for anything. Perhaps just use a horizontal waterproof zipper to save fabric weight? I'd eliminate the storm flap and velcro on the front and move to a waterproof zipper. Anyone have the stretch SST? How windproof is it? Is it basically a softshell? Keep it simple, just a couple of big pockets, maybe just one waterproof, the problem with waterproof pockets that ones you let it open can gets water inside. More pockets more problems founding gear, old school loves lots of pockets and vests… but when your in a boat, actually you have all you gear in a bag, if your wading better move light, if your chasing steelhead you just carry one box of flies a clipper and some sinking tips or tippets. So Why all the extra pockets, if you want to carry more, have a nice light waterproof backpack or a vest or any fishing pack. New colors,will be nice. Don’t put any fleece at the collar, not always good when your hard wading, gets to hot. The problem that I have with my last SST (and with another brands also) is after 4 moths guiding in Patagonia under bad weather, wet all the time , they all stinks, no matter what I do to wash them and clean them. Power tested the SST this last week on the Kenai tribs. LOVE it. 1) The collar - perfect warmth/bulk for sloppy days on the OP chasing steel, but for slightly warmer days when sun peaks - the zipper comes down a bit. As such, the collar becomes a bit clumsy and seriously blocks vision when fiddling with gear in waist pack, belt, or trying access bear spray at a moment’s notice, etc. (when looking down to fly box held in hand - collar blocks vision most of the time - a frustrating experience when you're trying to efficiently search for the next fly to throw on). 2) Pit zips - must have. When sun makes a guest appearance - things get a bit toasty. 3) Waterproof camera pocket on sleeve - solid idea. I keep my digital in an inside pocket, but when Bennett flounders with a 24 inch bow, I can't get the camera out in time before he fumbles at the goal line. 4) Fly Patch - tonal patch on a chest pocket? Big plus. 5) Cuffs - had a bit of line eaten by the cuffs this week. Tough to rectify I know, but food for thought. SS - the jacket is money. Love it. If no changes were made I'd still be a happy flogger. All comments are food for thought. I have owned an SST since the early 90s. I'm on my second one now. I really love it for freshwater fishing but don't find many of its features very useful when I fish salt water (90% of the time). I would love to see Patagonia develop a jacket similar to the SST specifically for the salt. All around a great jacket, I'd be for keeping it pretty darn simple.As light a weight material as possible. As long as it's water proof and abrasion resistant no point in carrying the added weight around if it's not giving you any additional advantage. No back pocket - who uses it? internal mesh pockets for quickly stashing a hat or gloves (high not low) no storm flap in front. Perhaps flat elastic panel pockets on the outside of the large cargo pockets - great for stuffing in tippet spools etc , better than fishing around for them than at the bottom of the cargo pockets. And yes pit zips - they do make a difference. No waterproof pocket, once water gets in it's no longer waterproof and you can't get the water out - better to just buy a waterproof camera. Simple is the way. Thank you Way Upstream team. There seems to be a variety of views, features and opinions that have emerged. Let me start my saying “bold simplicity” or “functional simplicity” remains a guiding philosophy for the Patagonia fishing team design. Two comments call for this view (Carlos and Rustyrat) to drive the SST direction/design. I wouldn’t say that the other voices aren’t asking for simplicity it’s just that these two views clearly call that out. Fabric/Zipper – These are big decisions. What I think I’m hearing is for a more burly fabric than either the current or some of the recent versions. Am I correct? The same seems to be said about the center front zipper. Those that added this comment, please tell me what size zipper you have and what you think you need. Zipper size is sometimes written on the backside of the pull carrier. Pit Zips - 5 people out of the 13 who’ve left a comment have asked for pit zips. This jacket has never had this feature nor have we made a wading jacket yet with pit zips. This is a tricky one for me. The current Stretch SST uses a 3-layer stretch-woven nylon with H2NO Storm barrier technology that’s completely waterproof but with softshell level breathability. I have been worried that the pit zips would actually compromise waterproofness and add underarm stiffness. Those that want pit zips please continue to expand on the idea for me. Waterproof pockets – This is something that the current SST and some older models already have. It’s on the inside. A waterproof pocket bag and vertical, reverse coil, coated zipper are all part of it’s design. Has anyone got comments on this for function? I realize that some have mentioned the need for an outside location but others have said that waterproof pockets get wet no matter what. Another thing to note is that there are some great waterproof bags and housings being made specifically for camera and hand-held technology. I have a kayaker friend who has a small roll top bag for her Treo that actually allows you to use the thing without removing it. That blows away anything a conventional pocket and closure can do. The bags and housings are under close investigation by the design team. Keep the waterproof pocket comments and ideas flowing. “Zingers” – All of our new jacket and vest development offer multiple retractor attachment capability. Simple webbing bars or more elaborate die cut tabs receive pin back, post or clip style zingers. The user can choose and attach whatever suits them best. The SST will be a candidate for this same capability. Exterior fly patch – There are some clip style fly patches that interest me, mostly because they can be added or removed without requiring a permanent Velcro patch. I personally like this approach for jackets but all our vests come with a vertically oriented patch and ripple foam (Velcro). Exterior mesh pocketing – I’m investigating this. Almost every pack makes use of this concept so what not adapt it to a jacket? I think it could be both functional and aesthetically appropriate. Saltwater – The trims experts have been researching options here and quite honestly there haven’t been many good solutions….up until now. There’s a manufacturer that has dialed in the coated, plastic tooth, fully non-corrosive, locking slider. We are testing it now! Stay tuned. I do have to say though that I live in saltwater world and have had very satisfactory results with the nickel coated pin, box and sliders as long as I do a little basic maintenance. A little freshwater rinse and a dab of lube go a long way in preventing corrosion. I’m religious about rinsing all my gear (rods, reels, line, shoes, waders, jackets and anything metal) but I know many guides and captains who cringe when I say “maintenance”….and I understand why. When you are taking clients out everyday and gear gets tossed in the forward hatch there isn’t always time for proper care…...and without care the metal can turn green quickly. Know that I’m working on it. What other features are important for saltwater use? Color – If you could only have one color what would it be? With that said, what color would you pick second? The waterproof-to-the-elbow idea has been on my radar. I’ve been looking at some commercial fishing attire and am seeing some creative solutions to this. Good observation Brookiefly. Good suggestions everyone. Your participation is appreciated and continues to be desired. Keep the conversation(s) going. Don’t hesitate to add thoughts to older posts like Sticky rubber soles, Waders (Come on in the water’s fine), Fly boxes (Inside the box), Tools (Tools of the Trade) and more if you haven’t already. Hi Steve, Concerning the pit zips, I'm not sure you need the elbow to lower rib type zips that you see in trad climbing jackets. a 6-8" zipper that runs up the chest under the arm to the arm pit (or aong the inside upper arm) is likely to do the job for venting. My expereince with this jacket is that when I wear it, I tend to do so for the whole day I leave the vest/fanny pack at home stuff the pockets and head out. While I may start in the cool rain it may warm up later and venting is such a nice option. I think a lot also depends on the type of fly angler you are. If you're fishing from a drift boat or tend to walk only short distances when fishing, the zips are less important. If like me you often take a more roving approach to your fishing that involves plenty of hiking the zips would be really appreciated. As for fabric tough yes heavy no. Most fishing specific jackets on the market are not designed to maximize breathability. If stiffness was not an issue pit zips would make a difference for the backcountry fisherman. Eliminate the insulation from the collar area. The user can decide how to layer. Narrow the dimensions of the fully zipped collar. It's way too big, even stuffed with all that fleece. Hey great stuff. I hope the designers take your suggestions into account. The best products for outdoor pursuits are the ones that are tested by those who actually use them regularly. I'd love to give your blog a shout-out on my site. Would that be alright with you? Hmm wading jackets are tough. Something I'd like to see if maybe two versions for different uses. I have fished in Alaska and BC where it can rain all day everyday for a week or more. This would require the best waterproof jacket money can buy and no one in their right mind would skimp on a jacket when going to these places. On the other hand I live in Colorado where you basically have to contest with the occasional rainstorm which can be heavy but why would you want to carry around a heavy rainjacket all day for an hour rainstorm. So maybe a lighterweight version, that can easily be carried in the back of a vest. I like the way one of the other guys out there did heavy duty fabric on the shouders and top of the arms but used a lighter version on the rest of the jacket, not a bad idea. Heres a few things that i feel are important some of which are probably already in your jacket but just food for thought. 1) D ring on the back for a net and D rings on the front of the jacket. 2) Retrator on the front I like, but I dont like the coil style as flyline will eventually get stuck in it and you dont want that to happen when a steelhead smacks your fly for the first time in 4 hours. 3) I like the larger style pockets in the front as I tend to use the jacket as a vest when fishing Alaska or BC where its going to Rain a ton. Make sure it fits the larger Morel fly box which is about the biggest box out there. 4) Inside waterproof pocket Dont get water in it in the first place and it will be ok and of course you should still have a waterproof camera as well, the pocket won't help when you drop the camera in the water. 5) Gotta have seperate collar and hood, looks like you have that on your sst now. 6) Wrist cannot have any water absorbing material. If its neoprene or rib knit or anything like that its going to get wet and going to get cold and clammy, not fun. Not ot mention how bad it smells after a week of fishing. 7) I like the big pocket in the back for whatever, lunch, TP it works keep it. 8) Gusseted arms or angel wing arms or something similar in the pattern cut that you can move around with the jacket riding up. I think most jackets have this now but its important for all day comfort. 9) Hoods, I hate wearing my hood and will do anything I can to keep it off. I thinks it more a sound issue where I want to hear whats going on around me. Keep some peripheral vision. 10) Fly patch sure can't hurt. 11) I think I like the use of a waterprrof zipper in the front instead of a big #10zip and flap with velcro to cover it. First waterprrof zips are in style and second if your in a hurry to zip up the big zipper end up catching the flap and not going all the way up. And make sure the collar is big, make it huge even. Put some layers on, R1 pullover, R2 vest and an R3 jacket and zip em all up and see if you can still zip the rainjacket up comfortably. 12) Colors, tough one too has to go with the line. Mix it up, you've been using Green try a Tan or light brown or dark brown. Make it slightly different than the waders or guys wearing both will look hmm well kind of silly probably. Also give it some good marketing hang tags, seems like Patagonia is missing a little there. I like what you were saying about the wader material self healing itself and its the first I ever heard of it. For the waders I think thats a huge selling point. Mojoman, sorry for the delay in responding. Thanks for investing the time. All of your feedback has been incorporated into the information that the designer is digesting. The same is true for everyone else who has left a comment on the SST, waders and so on. The task at hand is to sift through data and develop the SST of tomorrow....but keep in mind that bold simplicity is the guiding mantra. 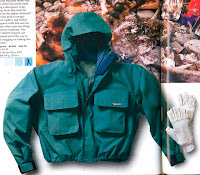 Do you have any photos (or workbook images) of the redesigned Deep Wading Jacket? My buddy Travis from Bozeman saw a sample and says it's a great jacket. Thanks for the inquiry Bradley. I do have some great pix of the new Deep Wading Jacket. I will either do a post or leave another comment with links to them. Stay tuned. Wow - the new Deep Wading Jacket looks great! It even seems a bit longer than past versions. Not exactly a pure version of the SST, but how about a hybrid of the long sleeved paddle top and the SST, something like Simms Surf Top or the Aquaskinz Evo2? This time of year in the Northeast, my judgement can become clouded by breaking fish, and it's not unusual to take the occasional wave on the head. Even with waders and a raincoat zipped up to my chin I got home with a soaking wet shirt last night. The Paddle top looks like it'd do a great job of keeping me dry, but I'd love to have pockets and maybe a d-ring on there somewhere. You describe a real need Matt. I've been using two methods to deal with "clouded judgement" and head-high waves. One is using the Patagonia Long-Sleeved Paddle Top over waders. It works. If any readers have experience with this method please chime in. The other method is to use a wetsuit. I actually have a two piece set up - 2mm bottoms and a L/S Water Heater Top. Footwear can vary. I wear pull on pants and a shirt over it which makes me look like I'm wet wading to anyone watching....but this time of year there are very few watchers. Your comments/suggestions did spur some creative juice flow. I have some ideas to ponder. Stay tuned. That's a shot Thad Robison from AEG while in Mongolia. He's also wearing the Watermaster II waders and Riverwalker boots. You'll see a lot of our gear on the AEG crew. Check out their blog - http://www.aegmedia.com/blog/tbd/ and their website to see more - http://www.aegmedia.com/.